Sorry... the 2017 Volvo V90 Cross Country is no longer being sold as new. 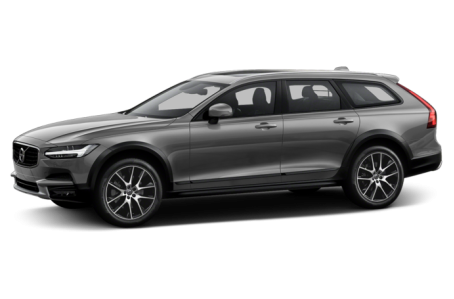 Instead, take the first step to a great deal on 2018 Volvo V90 Cross Country with a free price quote! Volvo recently expanded its lineup with the S90 sedan and is again adding to it with the 2017 V90 Cross Country. It debuted at the 2016 Los Angeles Auto Show. With the V90 Cross Country, Volvo continues its long history of producing wagons and then uprating them to go off-road. As you'd expect from a car designed to go off-road, the V90 Cross Country rides higher than a conventional car. And the wagon features a long hood that, while it looks great, might make it hard to judge where the front of the car is in tight spaces. Volvo said it tested the car in a secret testing area in the "frozen north of Sweden," so hopefully engineers checked that out while they were up there. The rest of the V90 follows the traditional Volvo styling, with the automaker's family grille, Thor's hammer headlights and chiseled body parts. There aren't a lot of specifics about exactly what luxury surfaces await inside the V90 Cross Country, but Volvo assures us it's "sumptuous," and will feature the connectivity and entertainment features of the Volvo S90 and V90. Presumably, this also means Apple CarPlay and Android Auto will be available. That also includes the option of a Bowers & Wilkins stereo system. There's one engine available for the V90 Cross Country, a 316-horsepower, supercharged and turbocharged 2.0-liter four-cylinder that's matched to an eight-speed automatic transmission. The V90 Cross Country comes with all-wheel drive standard and its ground clearance is 8.3 inches. Volvo hasn't released much information about the standard and optional safety features of the V90 Cross Country, but the company does pride itself on its commitment to safety, so check back for more information.